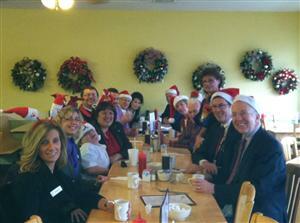 Members of the Kensington-Berlin Rotary Club celebrate the Holiday season by joining together for a festive breakfast at Josies. Guests included DG Eileen Rau, DGE Mike Barnett, Dave Erwin, Superintendant of Schools, Fran Kennedy, Principal of Berlin High School and future Interactor Rielly Pavasaris. Mr Erwin and Mr Kennedy were honored by the club for their ongoing support of Rotary projects. They were inducted into the club as offical Honorary Members of the Kensington-Berlin Sunrise Club.